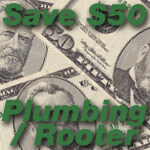 $50 off any plumbing repair or service. Not valid for third party, new construction customers, with any other offers or discounts, or prior sales. Coupon required at time of service. Void if copied or transferred and where prohibited. See invoice for details. Any other use may constitute fraud. Not containable with other discounts. Cash value $0.001. $200 maximum discount. Expires 5/29/2019.